The Lazo Rosary (sometimes referred to as a Laso, Lasso, or Lazzo Rosary) is a Mexican wedding tradition. It is made of two separate rosaries joined together with an additional center and crucifix. 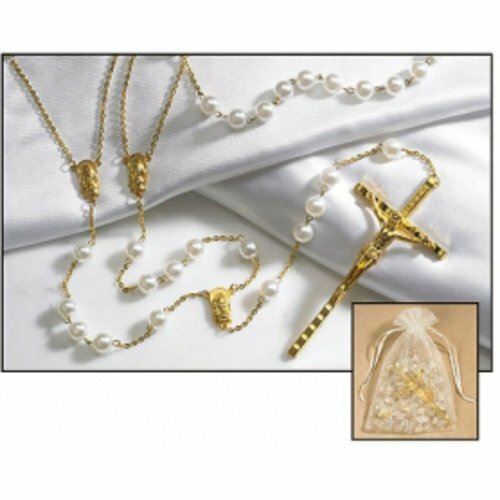 One 5 decade rosary loop is placed around the bride's neck and the other around the groom's during the wedding ceremony. The Lazo Rosary symbolizes the unity of marriage as one body in Christ. Traditionally, it is the padrinos (godparents) that place to rosary on the couple. Padrinos play a special role in the wedding ceremony and, in some cases, even offer financial support for the festivities. The padrinos are typically a married or engaged couple. Throughout the newly married couple's marriage, the padrinos also act as mentors. The Lazo rosary can be kept by the couple as a reminder to pray together and as a wonderful keepsake of their wedding day. Some separate the Lazo into two rosaries. One rosary is given to the mother of the bride and the other to the mother of the groom. The mothers of the newly married couple are to use the rosaries to pray for their children's marriage. As with many traditions, this ceremony has most likely evolved. It is said to date as far back as the Aztecs. During the Aztec wedding ceremony, the tunics of the couple were tied together as a symbol of their unity. The phrase "tying the knot" comes from ancient acts in many cultures around the world where couples are joined together on their wedding day with a symbolic gesture that physically ties them together in some way.